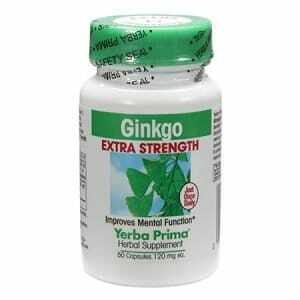 BENEFITS: Yerba Prima Ginkgo Extra Strength contains the patented Ginkgo biloba leaf extract that is clinically proven to work in numerous double-blind, placebo controlled studies, plus the assimilation boosting nutrient Bioperine® black pepper extract. Ginkgo has been shown to maintain or improve memory, cognitive function, learning capacity and emotional mood. It does this by maintaining a normal, healthy blood circulation to the brain and throughout the circulatory system, and by its function of antioxidant protection within the brain and circulatory system. Maximum Absorption: Ginkgo Extra Strength provides maximum absorption. Our Extra Strength formulas are made with standardized herbal extracts, which are assimilated more completely than common powdered herbs. Bioavailability of our Extra Strength herbs is further boosted by the addition of a patented black pepper extract, Bioperine®. As part of our Extra Strength formulas, it actually increases the amount of herb crossing the intestinal lining into the bloodstream. What this means to you is greater absorption, which equals greater benefits. Suggested Adult Usage: Normal Use: 1 capsule daily, with or between meals. Intensive Use: 1 capsule morning and evening. Best used every day. Other ingredients: BioperineÒ black pepper extract, cellulose, USP Kosher gelatin capsule. BioperineÒ is a trademark of Sabinsa Corporation.